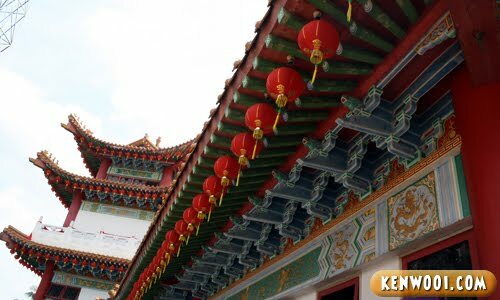 The famous Thean Hou Temple was one of our destinations during the recent family trip in KL. To be honest, I never knew about this temple before. 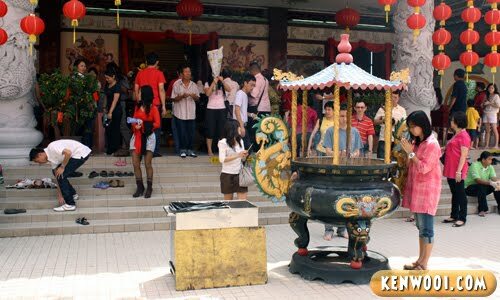 All along, I thought Kek Lok Si at Penang Island is the only “happening” temple during Chinese New Year. 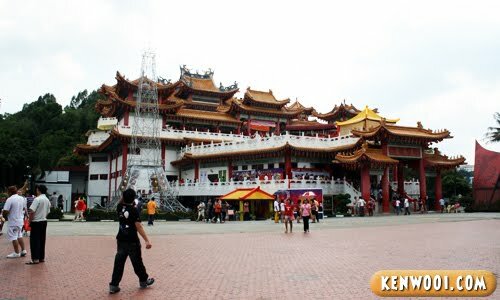 Thean Hou Temple is one of the biggest Chinese temples around Kuala Lumpur and is also a favourite tourist location. 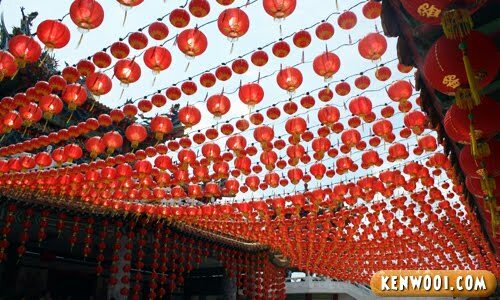 Like any other religious places and Chinese temples, especially, it’s a common tradition to put up a massive number of red lanterns to usher the grand Chinese New Year. 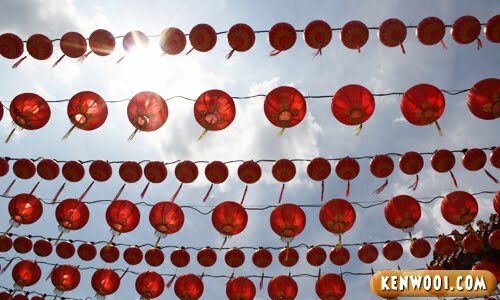 Lanterns here, lanterns there, lanterns everywhere. You won’t miss a single one wherever you are. 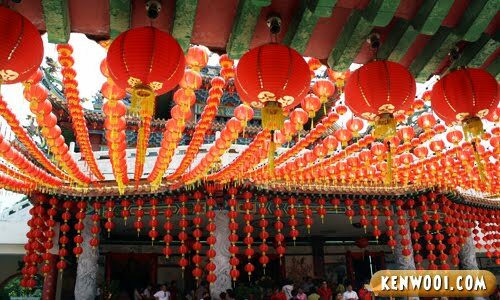 As you follow the directions to the prayer hall at the higher floor, there are lines of lanterns hung up along the roofs. And when you reach the prayer place, you’ll see even more lanterns. And more people too – mainly consists of devotees, praying for a better year, and travelers, witnessing the culture. While my parents also went to pray, I walked around and took photos. The photo above is taken from a higher level. I wished I could have visited during the night to see the lanterns light up. 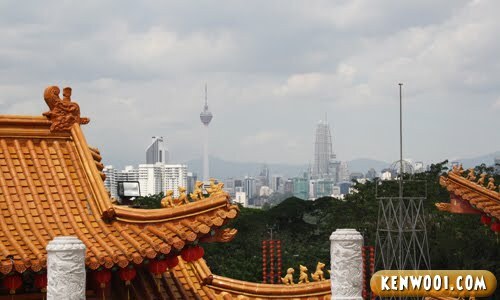 From that higher floor, the KL Tower and Petronas Twin Towers can be seen. 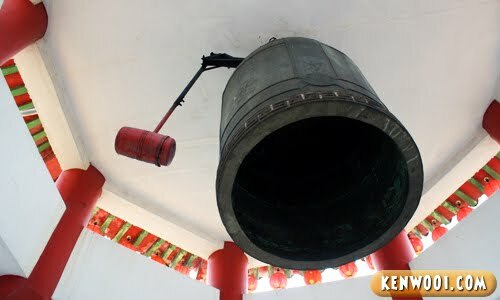 A big huge bell hung on the ceiling. I wonder if anyone still uses it, or it’s just for decoration purpose. 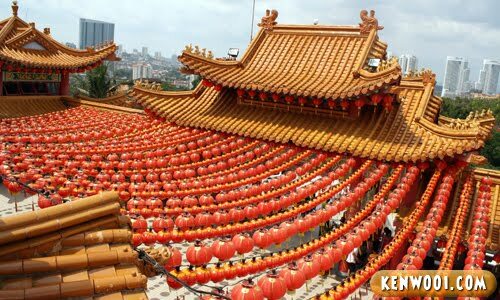 Anyway, by looking at Thean Hou Temple’s grand architecture and the number of visitors, it’s undeniably a popular tourist attraction. The art sculptures on the edge of the roofs makes it even more distinctive. 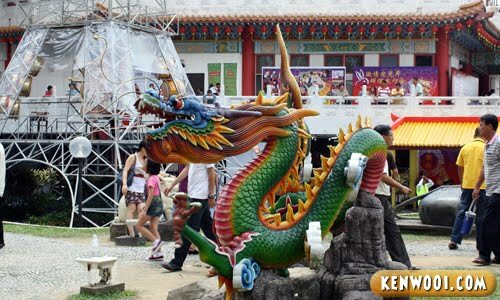 Beside the temple, there’s an open-space park nearby with statues of Chinese animal zodiacs. While the rest took photos with their respective animals, I got mine. The dragon is such a beauty right? 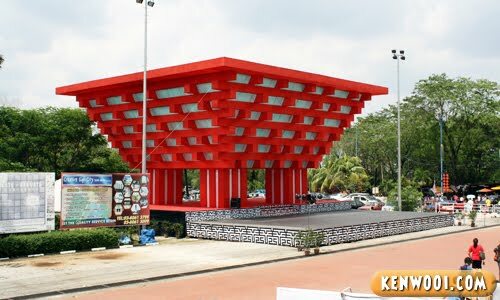 Also within the temple’s compound is an interesting looking structure. 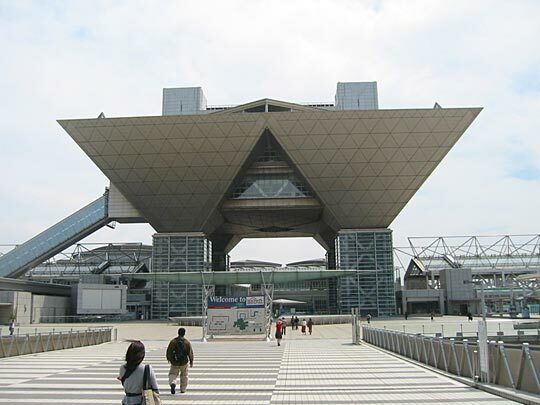 Looks like an up-side down semi pyramid to me, but if you look properly – it’s actually a stage with a funny roof. 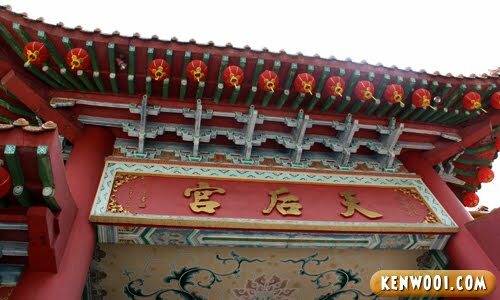 So yeah, there’s nothing much to talk about Thean Hou Temple – this entry serves mainly as a photo sharing session for those who’ve never visited the temple during the Chinese New Year festival. 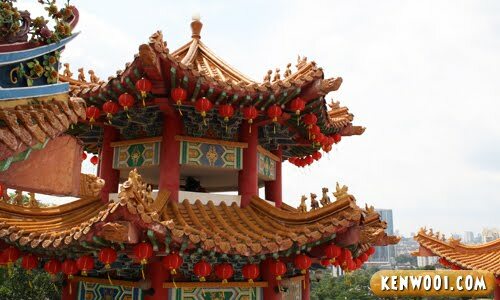 It’s quite easy to get there since it’s near Mid Valley City – located off Jalan Syed Putra. Google Map for exact location and address. Fernando Torres Liverpool Books at MPH! hope still not late to wish happy chinese new year.. 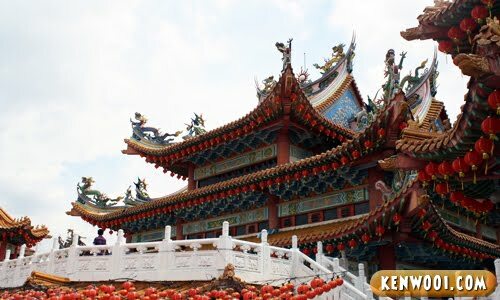 If you like temples, come to Sibu… We have the biggest in South-east Asia – combining Taoism, Confucianism and Buddhism. I haven’t been there – not into temples. 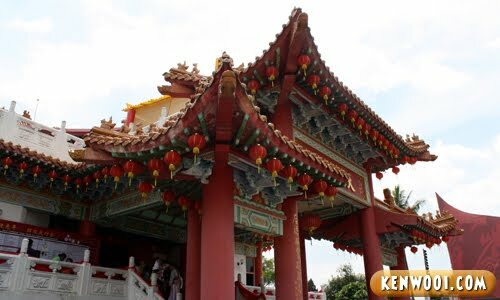 Beautiful temple Ken! I did my ROM there on the 14th Feb, last week. Could take lots of beautiful pictures there. It was like 18 years ago since my last visit to there. ken whut camera are u using? i always thought ur pictures are googled, they look very nice. :D oh, happy chinese new year!! Nice Ken! I went to Dong Zen, also quite nice! hey i went to thean hou too!